Cult Skincare | By Millie. Everyday there are a few skincare products that I always end up reaching for, whether it be on a no makeup day or not, treating my skin is something I love to do. A lot of these products are high end, but I feel like skincare products are the one thing worth investing, but with that being said, of course you can find good products at a less expensive price point. The Nivea Micellar Cleansing Water is something I love to use either in the morning to refresh my skin, or in the evening to remove makeup and set my skin up for a good cleanse. 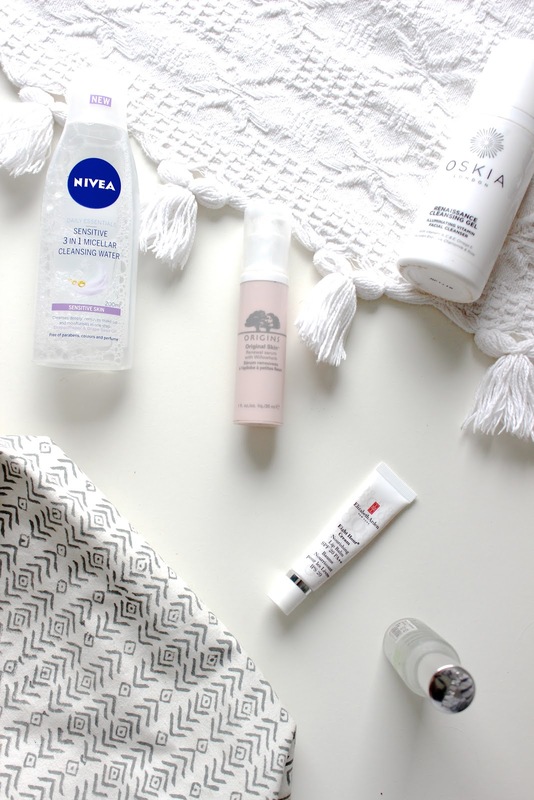 This is the best micellar water I've tried and there are now loads at the drugstore to choose from so I'm sure there's one for you. This is a 3-in-1 formula so it doesn't just remove makeup, it cleanses the deeper layers of skin and leaves it moisturised. Perfect for a lazy night! Following on from this I love my Oskia Renaissance Cleansing Gel which has become a cult product in the beauty world. Even though it says gel, I would say its more creamy and turns into a milky formula when mixed with water. It smells of roses which is nice and it dissolved makeup well too, a good all rounder. For the morning there's nothing better than a good facial spritz and the Caudalie Beauty Elixir is one I love. Out of all the ones I've tried out, this one is definitely the most refreshing and the mint and cucumber leaves your skin feeling super cool and soothed. You can pick this up in a mini size which is handy to throw in your bag for boosts throughout the day. On top of that I like to add a nice serum, and applying one in the morning is something I've only started doing but love the difference it makes. The one I've been using is the Origins Original Skin Serum which is creamy in consistency and preps you skin nicely for moisturiser. I love this because it doesn't weigh the skin down or leave it oily like some which are more intense, it also keeps my skin more moisturised and plump throughout the day. A good lip balm is key to luscious lips and Elizabeth Arden do a great one which is part of their 8 hour range. It's an intense cream/gel formula and works great overnight to leave your lips plump and nourished. What skincare products are you loving?